Mei takes off her eye patch to reveal a green doll’s eye. She then tells him of the story from 26 years ago, with the additional detail that in the class picture after graduation, the dead Misaki was in the picture. Later, Kouichi asks Yukari about Misaki, and she chides him to never say that name in Class 3. He then asks his aunt about it and what class his mother was in. She blows him off, but does say that his mother was in class 3. The next day, on his way to meet Mei on the roof, Teshigawara calls him and tells him not to mess with things “that don’t exist.” That night, the nurse calls back to tell Kouichi that the girl who died was named Fujioka Misaki. The next day, he asks Mei about this, who says that she was her cousin. He then asks why no one acts like she’s there, and she says she doesn’t exist. Yukari then rushes out of a class, sees, Kouichi and turns around, then trips down the stairs and impales her neck with her umbrella, killing her. So we have our first on-screen death, with Yukari getting offed in a rather gruesome and painful way, as she didn’t die for several sections after getting her umbrella shoved through her neck. I suppose technically she’s the 2nd death, as Fujioka could be considered the first, though it was off screen. I’m guessing the “other part” of the story is basically that after the dead Misaki “graduated” – that exactly things like this have been happening: a disproportionate number of students from class 3 have found ways to get killed, which of course is getting blamed on the death from 26 years prior. In any case, we found out that Mei wasn’t the Misaki that died in some way, so that clears that up. I’m also swinging back toward the line of thought that this is a series where things merely appear to be supernatural, but aren’t. Of course, that means that Mei’s comment that “no one else can see her” is merely a metaphor and not actually literal. Perhaps it’s because she shares a last name with the dead girl, and they ignore her for that, or because she seems creepy, or some combination. Maybe it’s some attempt to “undo” the work of the class 26 years ago. Instead of pretending that the dead Misaki was still alive, this class is pretending that the real life Mei Misaki doesn’t exist. I think this is bolstered by the fact that I think Yukari was responding, not to seeing Kouichi, but from seeing Mei in the hallway. This plus the fact that Kazami seemed to see Mei on the roof, and that the class seems aware of her existence I think leds credence to the idea that Mei does, in fact, exist, but the class’s ignoring of her is so extreme that they have convinced themselves that she does not exist. Kouichi continues his attempted befriending of Mei, despite her warnings, which includes talking to her in the auxiliary library. Kouichi then visits the nurse from the hospital to ask if a girl had died the night he met Mei in the elevator. The next day at school, Izumi, the “countermeasures” officer interrogates Kouichi some more about his past in the town, and tries to tell him the “situation” the class is in before being stopped by other classmates. He then follows Mei home, but loses track of her. The nurse then calls back and says that she found out that a middle school girl, who was an only child, had died, and her last name was something like Misaki. 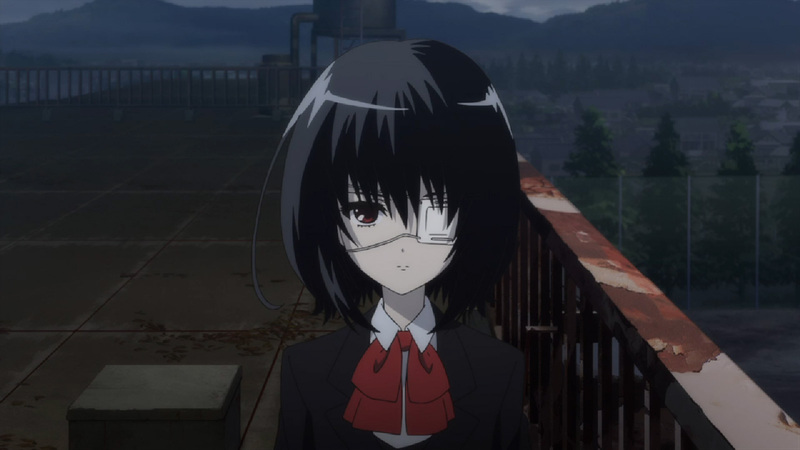 Kouichi then happens upon a dollshop, within which he runs into Mei again, who offers to show him what is under her eye patch. OK, so we know that a girl died, possibly with the last name of Misaki, and Mei said she was visiting her “other half.” So does that mean Mei is the ghost of that Misaki, or the Misaki from 26 years ago? Or maybe the 2nd Misaki was somehow a reincarnation of the original Misaki, so Mei is kind of both’s ghost? Or maybe it’s nothing. I’m not totally sure why the classmates are reluctant to tell Kouichi about the class’s “problem,” and I’m not sure what happened at his first day changes the situation. Maybe the fact that he’s already seen Mei makes them more reluctant to tell him what’s going on for some reason. Going back to some of my speculation from the first episode – I’m not sure if anything his mother or aunt did or didn’t do is the reason they associate Kouichi’s last name with death. After all, presumably they weren’t married yet (his Aunt definitely doesn’t seem to be) so they would have had their maiden names at the time, not Kouichi’s current last name of Sakakibara, so I’m completely at a loss as to why Mei told him they connect his name with death. Also, something has to be up with that doll shop. Mei was carrying a doll to the morgue, so I don’t know if it’s just that she likes the dolls, or if it has something to do with what is going on in the class. Kouichi happened on a doll that he thought looked like Mei, so if Mei is the ghost or whatever of the Misaki that died, maybe dolls are made of each student that dies in the class? I don’t know. So far we have a lot of mystery, but not a lot of clues as to what the solution is, and it just got even more complicated in this episode. This is the second new series I’m picking up from the winter season. I’m not particularly a horror fan, but this seemed like a pretty well reviewed series so far, so I thought I would try it out. I guess if for some reason I don’t like it, I only have to put up with it for 12 episodes, but, of course, I hope that it’s good. There is a story about Grade 9, Class 3 at Yomiyama North Middle School: 26 years ago, a girl named Misaki, who was the most popular person in the grade, was killed in an accident. The rest of her class, distraught by her passing, pretended that she never died, all the way up to her graduation. Now, Kouichi, who is transferring to the school due to his father’s job, is taken ill as the school year begins, and is visited by the class’s officers, though they seem to interrogate him more than wish him well. 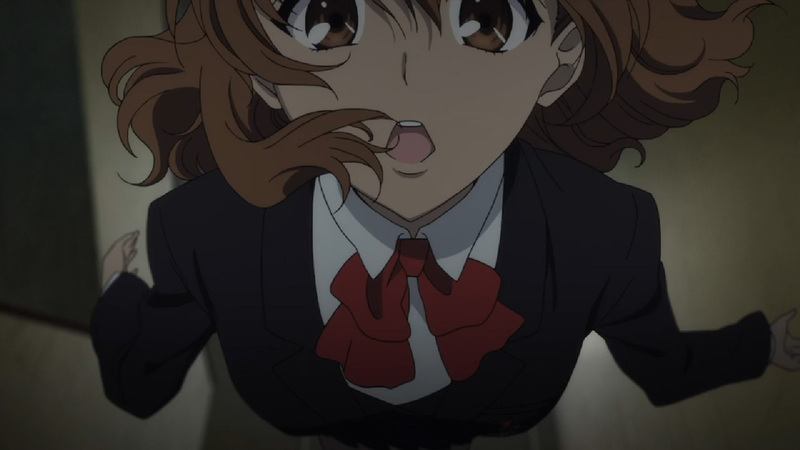 That night, Kouichi runs into a girl in an elevator heading toward the morgue whose name is Mei Misaki. At his first day of school, his classmates appear to be hiding something from Kouichi. Kouichi later finds Mei on the roof, who tells him that his classmates associate his name with death. Well, since this is supposed to be a mystery, I guess I’ll try to do as much speculation as I can in these write ups. I guess let’s get the seemingly obvious stuff out of the way: I don’t think there is any coincidence that Mei shares her last name with the girl who was murdered 26 years ago. 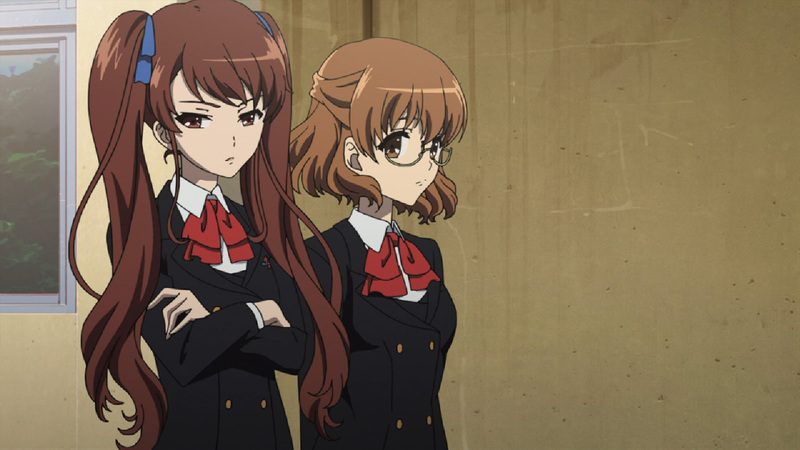 Furthermore, she and the rest of the class keep their distance from each other to such an extent that the rest of the class doesn’t even seem to acknowledge Mei’s existence. I think the primary question here is whether Mei is a relative of the girl from 26 years ago, or merely her ghost. I suppose that will depend on what direction this show takes: will it take a more supernatural turn or will it only appear to be supernatural, but actually not be? Personally, I lean toward the former since that seems to be how shows like this work. The second immediate mystery is more unclear: why would the class connect Kouichi’s name – specifically his last name – with death? It appears both his aunt and his mother attended this same school, though it’s unclear whether they were in class 3 (though my guess is that they were). We know that his aunt Reiko attended the school 14 years ago, but we don’t know about his mother. It’s possible that one or both of them are associated with some deaths that occurred in the class at the time, thus why his name is associated with death. And now my first speculation on what is going on (and please no one spoil whether I”m actually right or not yet): Misaki’s death 26 years ago was by no means an accident. In fact, I have a feeling that students from class 3, either a significant portion, or perhaps the entire class, conspired to kill her for some yet unknown reason, and then used their behavior of pretending she had never died as a cover to act like they weren’t responsible. As a result, the “ghost” of Misaki, who at the moment is in the form of Mei, has taken revenge of members of Class 3 ever since. Kouichi’s roll in this story will be to uncover the truth of what happened 26 years ago and, presumably in the process, end the reign of terror of Misaki’s spirit. Now that I’ve wrapped up catching up on the Fall season, it’s time to look at the Winter season. I’ll of course continue Shakugan no Shana III and Last Exile: Fam, the Silver Wing, so I’m looking for one or maybe two shows to supplement that. I’ll keep churning out episodes like I have until I catch up, which at this point may be pretty near the end of the season. There didn’t seem to be a lot of interesting shows, but there were three in particular that peaked my interest: Ano Natsu de Matteru (aka Waiting in the Summer), Danshi Koukousei no Nichijou (aka The Daily Lives of HIgh School Boys), and Another. Waiting in the Summer is from the creators of the Please! series, and I loved Please! Twins, so that’s a plus. Plus the art and the synopses sounds interesting. Plus, it’s being simulcast on Crunchyroll, so I think I’ll pick this one up. The Daily Lives of High School Boys, I was iffy on at first, but after further reading about it thought it looked interesting. However, this series ended up being about the only one which was both licensed and NOT being simulcast anywhere that I can see, and I have a “if it’s licensed, then I don’t download fansubs” policy. So, I would have blogged this one, but because it’s licensed but not “available,” I won’t be able to. For Another, I’m really not a horror fan at all, but it has a good rating on both ANN and MAL, so maybe I could give it a shot. I suppose if I don’t like it, I only have to put up with it for 12 episodes. So it looks like for Winter 2012, I’ll be picking up Waiting in the Summer and Another and we’ll see how it turns out.